A heartfelt 2018 ConnTESOL THANK YOU to all of our presenters, vendors, speakers, panelists, and of course, attendees. Dr. Long has graciously shared his Powerpoint slides which accompanied his keynote address. They are available for download here. Plenary: “Multilingual Understandings of English Competence and Success,” by noted author and scholar Lourdes Ortega, a professor in the Department of Linguistics at Georgetown University. The New School has a long tradition of excellence in the training of teachers of English to speakers of other languages. We welcome participation by professionals who seek to address critical issues in the field and hone their own craft. The schedule for the NYS TESOL 48th Annual Conference is now available! You can register for the conference, check out the hotel, read the speakers’ bios, and see a list of sessions you can attend on practical topics such as ESL tech tools and advocacy for immigrants. Pre-registration will be available through October 26. The Journal welcomes proposals for special topics that are both timely and relevant to our readership. The topics can be drawn from research and practice across the educational contexts (PK16). Early bird registration is open now through September 1. Rates increase September 2 and pre-registration will be available through October 26. 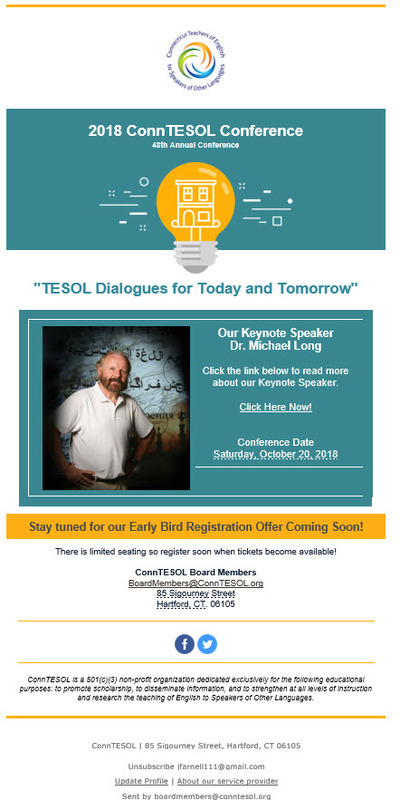 ConnTESOL 2018 Conference…Early Bird Registration Coming Soon!